Geez. 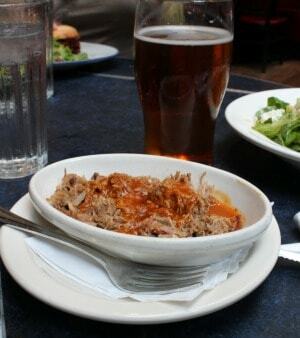 For a style of eating that’s meant to be consumed leisurely, messily, and preferably in the company of a pitcher of beer, barbecue sure has a legion of picky fans. It’s not a subject for the weak: discussions of the proper smoke ring alone can make dear friends into sworn enemies. Despite the dismissals of opinionated barbecue fans who pooh-poohed Blue Smoke when it opened in 2002, despite the red tape and wrangling required to funnel all that sweet, sweet hickory smoke away from the apartments pressing in on all sides, Danny Meyer’s urban barbecue joint on East 27th St. has persevered and flourished. 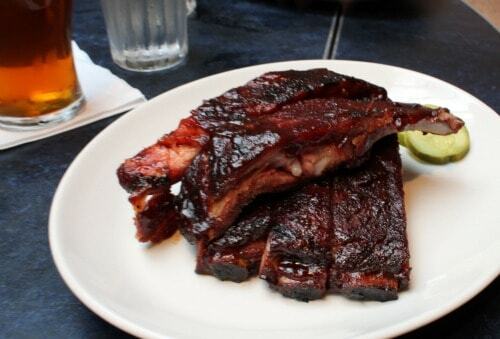 And if you’re coming to visit me in NYC, chances are I’m taking you to Blue Smoke for at least one meal. It’s not a darling, tiny, precious, overpriced bistro where there’s absolutely no chance, not even on a weeknight, of just walking in and grabbing a table, not without a two-hour wait. At Blue Smoke, I’ve never had to cool my heels at the bar for more than a half hour, whether at the height of dining rush hour or breezing in at 10:00 pm, whether I’m dragging two people or six along with me. Oh, and they’re punctual about it—when the host says he’ll get you in 20 minutes, you can set a timer for your retrieval at 19:59. Besides, it’s not like waiting at the bar for your table is like descending to the seventh level of hell. 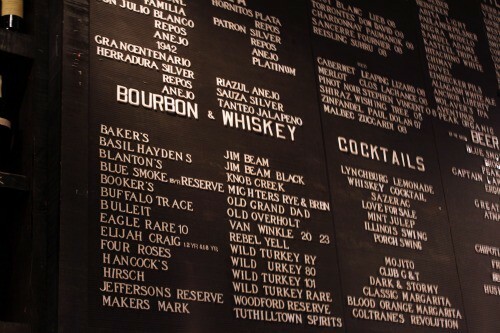 The cocktail list is stellar, the bourbon selection is vast, you can get a Paul Dolan Zinfandel by the glass, and the house Blue Smoke Ale is one of the best brews in the city. And six paragraphs into this story, I haven’t even mentioned the food. Where to begin? Reading the New York Times review published three months after its opening makes me realize how far the restaurant has come. No more foie gras (though yellowfin tuna continues to incongruously make an appearance), no more gloppy ribs. The lean and mean caramelized Memphis baby backs are my poison of choice, but my friends who love to chew on a fattier rib go for the Kansas City rack. The pulled pork always calls to me, but it’s not always possible to house a whole platter. So now I take a tip from my friend Sarah and just order a side of the shredded morsels, sometimes with an entire plate of deviled eggs (two entire eggs, halved and piquant with tart mayo) for myself on the side. 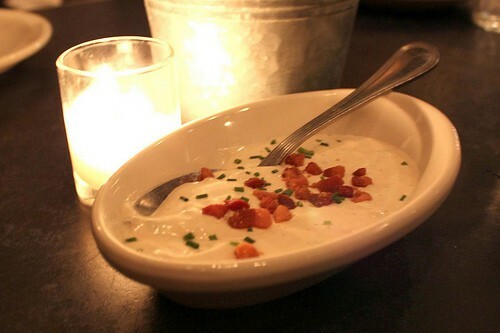 If the husband and I are having one of our bi-annual Fashion Week dinners with the Fug Girls, the meal doesn’t begin until a bowl of buttermilk blue cheese dip and a bucket of homemade barbecue potato chips are set on the table. The house burger is a more voluptuous version of what you’ll find at the original Shake Shack just a few blocks away in Madison Square Park, down to the crinkle-cut fries that snuggle up to the bun on the plate. Want to be really outrageous? Ask for the spicy cheese sauce on the side or save your leftover blue cheese dip (the barbecue potato chips always run out far too soon) for dipping. Basically, at this point, I’ve eaten my way through at least half the menu, including chicken both smoked and fried, brisket both lean and marbled, mac and cheese that rivals Stouffer’s nostalgic heights, and even a chopped salad for good measure. (Is there any chance of bringing back the BLT Salad? That thing was incredible.) Though its tribute to regional barbecue doesn’t scream “Manhattan!” and thus doesn’t spring to the forefront when compiling a NYC Bucket List, Blue Smoke is without a doubt one of my top five restaurants in the city. Vegetarians, carnivores, rib fiends, urban dilettantes, moms, dads, suburbanites, and West Coast transplants have all joined me at a booth or table and emerged totally zoned out by the experience. 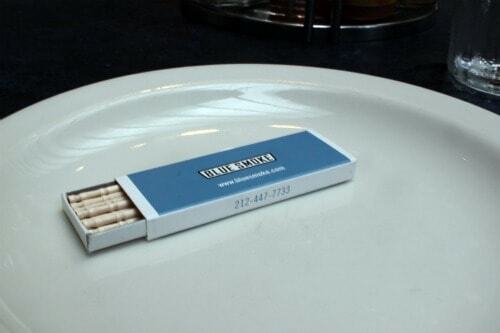 Blue Smoke is the people’s place. It is near perfection. It is a blue ribbon standard in a city of overpriced, underwhelming next-big-things, and it doesn’t let me down.